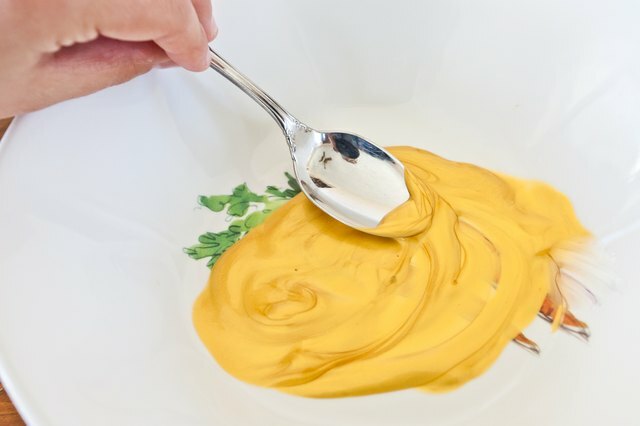 A careful combination of yellow, red and green food coloring can make a shade close to the color of gold, but food coloring alone doesn't give icing the glimmer of gold. Gold luster dust makes gold icing decorations as realistic as possible, working well for decorations such as sports-themed medals, jewelry or a pot-of-gold cake. The shimmering dust must be applied in a layer on top of icing -- the two cannot be mixed to achieve desirable results. 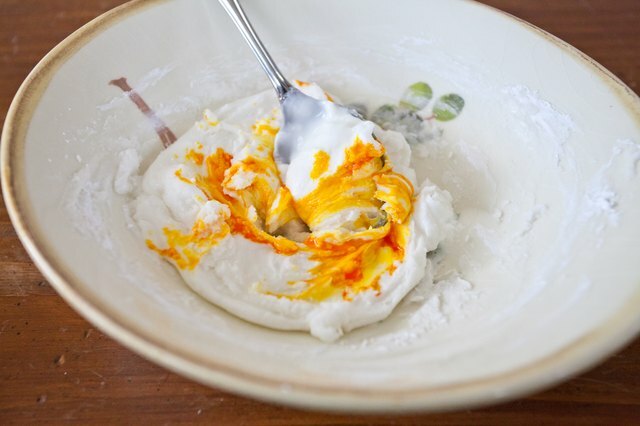 Add yellow food coloring gel to your white icing and mix thoroughly. Add more food coloring as needed to achieve the desired shade. Mix buttercream icing and royal icing with an electric mixer or by hand; knead fondant to incorporate the color. 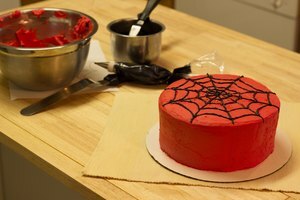 Add a very small amount of red to the yellow icing and mix until combined -- if you dip a toothpick 1 inch deep in yellow food coloring gel, dip only the tip of a toothpick in the red food coloring gel. Add a trace amount of green food coloring gel, if desired, to give the gold color an aged look. Pipe, drizzle or flood the gold-colored icing onto a cake, cupcake or cookie. You might try gold lettering on a cake message, or flood the entire face of a cookie with royal icing to make gold cookies. 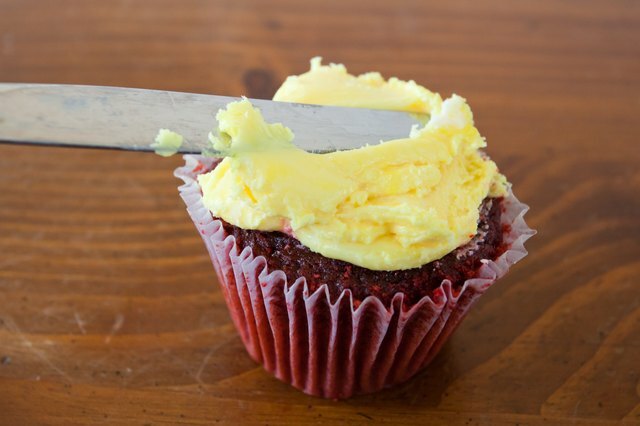 Wait about 1 hour for buttercream icing to harden; allow at least 8 hours of drying time for royal icing. One possible application for fondant is to shape small disks to make fondant gold coins. Attach the coins to the cake with royal icing used as glue. The waiting period isn't necessary for fondant. Mix gold luster dust with clear alcohol, such as vodka or rum, to the consistency of paint. Try alcohol-based flavor extracts in place of alcoholic spirits. 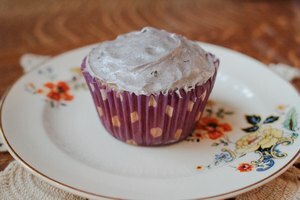 Alcohol won't affect the flavor of the frosting, and is necessary because it transforms the luster dust to a paint consistency but dries fast enough that it won't make the frosting runny. Start with 3 to 4 drops of alcohol for every 1/2 teaspoon of luster dust. Replenish the alcohol in the luster dust to maintain the paint consistency as the alcohol evaporates. 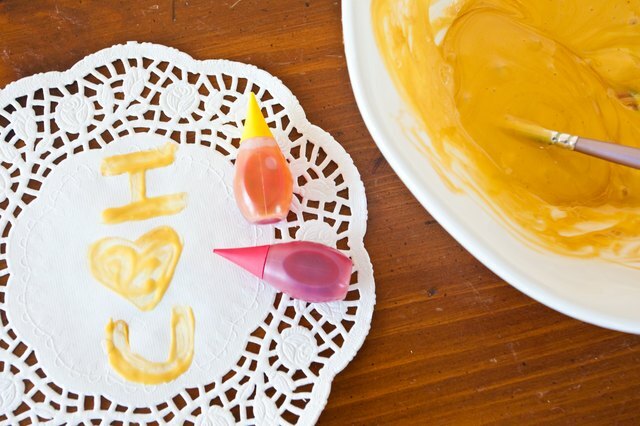 Brush the gold luster dust paint over the gold-colored frosting, using a fine-tipped artist's paintbrush for lettering and a wider paintbrush for filling in larger details. Allow the luster dust to dry for about 30 minutes. Apply a second coating of the gold luster dust paint. You can use gold luster dust directly over untinted icing. Tinted icing typically requires less luster dust and results in better coverage, particularly when used with a lighter shade of gold luster dust. Keep a supply of small paintbrushes with your cake decorating supplies, using them only for cake decorating. Clean the brushes thoroughly after each use, taking care not to ruin the bristle shape. One stray bristle from a properly maintained paintbrush, for example, can cause you to paint outside the desired area, especially with fine detailed areas like lettering. Small food storage containers work well for mixing luster dust. If you have leftover luster dust paint, leave the lid off the container until all the alcohol evaporates, leaving dry, hardened luster dust in the bottom. Cover the container with a lid and store the hardened luster dust with your cake decorating supplies. When you need to use luster dust again, mix in a few drops of alcohol to return it to paint consistency. Luster dust is technically edible, but like silver and gold dragees decorations, it should be consumed sparingly.